One of the core elements of HOLISHIP is the virtual vessel framework (VVF). 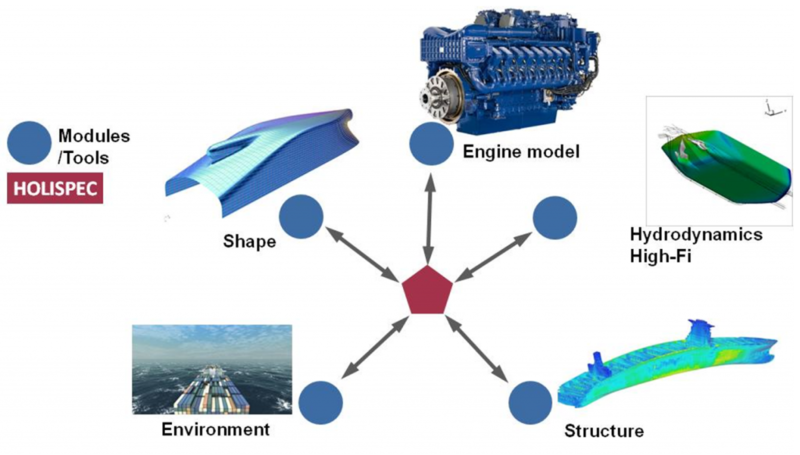 This framework will connect different tools with varying complexity to each other thus enabling concurrent simulations of distinct ship systems and ultimately aims at the simulation of the complete ship system in one framework. This will give the designer the capability of virtual prototyping and testing of new concepts for ship´s system and subsystems. Such frameworks already exist in other industries such as the automotive and aviation industry. HOLISHIP uses a framework from the aviation industry, CPACS/RCE of DLR, as starting point in the developments. The end result (HOLISPEC/RCE) will be a simulation framework for marine applications which can connect tools of varying application and complexity through the internet. Where the automotive and aviation industry benefit from economy of scale, i.e. a large series of one design is made, ship series often do not exceed 3 ships. Testing new designs or concepts using a prototype is therefore too expensive and never done making the time to market for new concepts much longer than in the automotive and aviation industry. Ship owners and operators through the Vessel for the Future initiative have brought this to the attention of the European Union. Horizon 2020 projects aim much more than FP 7 projects on demonstration of new concepts. Full scale demonstrations are costly, calling for a virtual prototyping system. A prerequisite for virtual prototyping is that all relevant systems and sub-systems can be simulated in the framework, allowing for lifelike interactions. No one company has access to all relevant tools, companies with different specialities will therefore need to work together. Companies are often reluctant to share tools as these tools contain their IPR. Even if the tool is shared as a black box there is the risk of backward engineering. HOLISPEC/RCE will therefore need to be able to couple the tools through the internet where the tools remain on the secure server of the owner of the tool to which access is granted for selected parties for an agreed time or number of simulations. HOLISHIP will use an existing framework as a starting point for the developments. 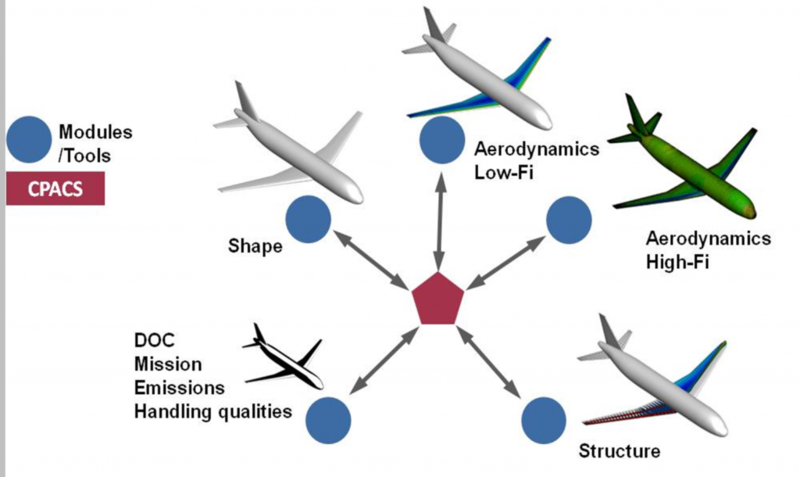 The CPACS/RCE framework originates from the aviation industry as shown in Figure 1. DLR has developed CPACS/RCE in various European and German national projects as an open source software which is free of charge. DLR is partner in the project and will contribute to the further development towards the HOLISPEC/RCE framework. In this way, HOLISHIP will learn from the mistakes made before and not run into the same startup problems. CPACS/RCE is a combination of two tools, CPACS and RCE. CPACS is a data format in which the input and output of the simulations is stored. In Figure 1 CPACS is represented by the red pentagon to which each of the tools is connected. Each tool, independent of its complexity and type, will read and write to the framework. The arrows between the tools and CPACS indicate the RCE communication tool. RCE is used to design the simulation and arrange the dependencies between the tools. A simulation is designed in the user interface of RCE where the tools can be connected to each other and simulation loops can be introduced. The simulation engineer will identify the dependencies and determine which tools will need to be warned if a parameter in CPACS is changed. As the simulation engineer is not a specialist in all components connected, tool providers can be asked by the simulation engineer to assist in the simulations. This makes the framework not only a framework to connect tools but also a framework to connect specialists. Partners working on the development of the HOLISPEC/RCE framework have completed a set of requirements for use for the framework. Based on this, DLR is developing the framework from CPACS/RCE as starting point. Main developments follow two streams, firstly the update of RCE to safely connect the tools over the internet and secondly the transfer from CPACS to HOLISPEC, i.e. marinisation of the framework. Figure 2 shows an example of what types of maritime tools can be connected to HOLISPEC/RCE. As indicated, connecting tools over the internet is an essential requirement. This enables the owners and developers of the tools to protect their IPR. Even if a tool is a black box, reverse engineering can tell a lot about the tool. The framework should therefore enable the owner of the tool to provide access to the tool for selected companies (possibly based on a use fee). Even through the internet reverse engineering is possible, therefore the framework should provide the possibility to limit the number of times the tool is called from the same server. Communication tool RCE developed by DLR will be updated to facilitate this. Cyber security is a key challenge in this as it should be prevented that third parties can access the simulations and the tools. Marinisation of the framework means that the CPACS data format needs to be updated to the HOLISPEC data format so that maritime parameters can be used. An overview of all parameters in the relevant tools will be made and the definition of the different parameters needs to be agreed on. As the HOLISHIP project is making use of a large variation of tools of different partners, it is expected that not all tools use the same parameter definitions. In order to have the number of tools connected to HOLISPEC/RCE as large as possible, the data format will be the same as the CAESES framework which is also under development in HOLISHIP. All agreed parameter definitions of HOLISPEC will be documented so that tool providers can develop plugs in case there is a difference in definition of the parameters. As there will always be development in tools, HOLISPEC will need to be kept up to date for new parameters and tools. In the HOLISHIP project the HOLISPEC/RCE framework will be used in two application cases. In the merchant vessel application case the framework will be used to introduce the human factor into the design. For a Damen short sea ship, Van der Velde Marine will design two manoeuvring configurations which will be simulated using the HOLISPEC/RCE framework with other relevant components. 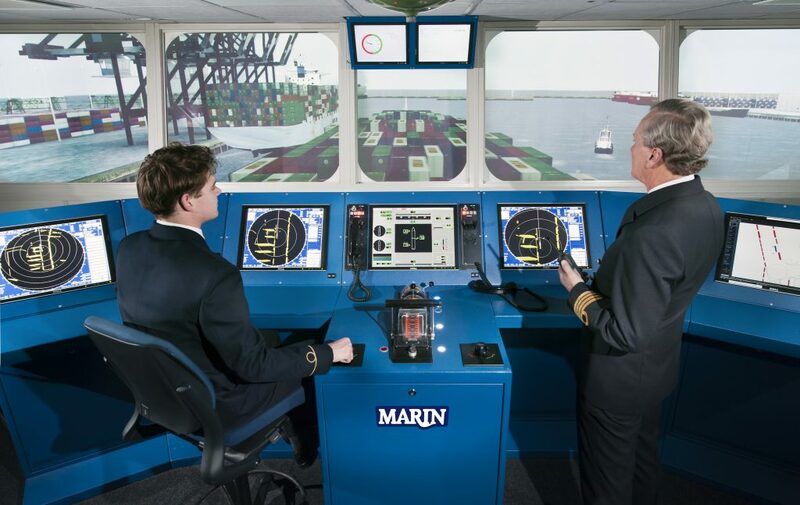 These results will be uploaded into the MARIN bridge simulator (see Figure 3) so that an experienced captain can experience both designs in port manoeuvres. By comparing the numerical results with the human feel, the design can be optimised for the use. Rolls Royce will use HOLISPEC/RCE in simulations of an offshore subsea lifting operation introducing various errors in the process to review the effect and redundancy of the systems. Various machinery systems will be coupled as well as the hydrodynamic models to simulate the ship models. The VVF subproject of HOLISHIP will conclude with a market uptake plan for the HOLISPEC/RCE framework. It is the intention that the framework will be made available for free and partners wishing to connect tools can choose per case if they charge a fee for use of their individual tools to the users. A view on further developments will also be part of this market uptake plan to keep on developing the framework.